Crystal healing therapy has been around since the beginning of mankind in some form or another. Though documented evidence of exactly how these amulets and stones were used didn't appear until much later, jewelry artifacts dating back nearly 60,000 years are evidence to humans' intrinsic fascination with these natural elements. Crystals as mechanisms for healing is based on the physical as well as supernatural properties of each stone. 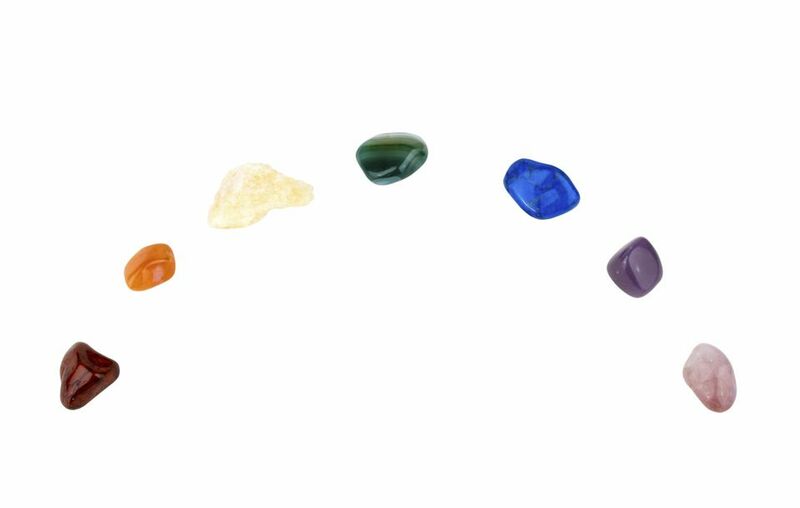 This slideshow will acquaint you with the fascinating world of crystal meanings by breaking down some of the common lore of each of the 12 birthstones. Garnet is a romantic stone that can enhance sensuality as well as protect against evil thoughts and nightmares. This birthstone, like other red stones, is associated with the root chakra, making it great for an energy or confidence boost. Not only would garnet help aid in relieving depression, it also embodies commitment, truth, and is a symbol of compassion. Ancient amethyst folklore suggests that amethyst has the ability to protect against drunkenness, which is great if you've had one too many cocktails, but I wouldn't recommend relying on this as a sobering technique. More commonly, amethyst helps instill clarity of thought and enhance one's intuition. It is a calming stone that promotes relaxation and stability. Aquamarine, as its name might suggest, has long been associated with the sea and was known to protect sailors on deep sea voyages. This pale blue stone is linked to the throat chakra and is used in deep meditation to calm the mind. Clear, colorless diamonds are a powerful component of crystal healing. They are used in combination with other gemstones and are said to enhance the metaphysical properties of every stone it comes in contact with. Diamonds enhance thoughts, lending the wearer a more creative or focused outlook. Not only has diamond been used to alleviate fears, it has been used in ancient times as a remedy for poison. Emerald is a passion stone and has been used to enhance your natural passion, regardless of what it may be. The green stone is associated with the heart chakra making it the perfect stone for healing and enhancing matters relating to the heart. If your self-control is lacking, alexandrite is the perfect stone for you. This color-changing gem is associated with the crown chakra and is said to enhance concentration. Throughout time, it has been known to protect its wearer as well as bring good luck. Like garnet, ruby is connected to the root chakra and is known to enhance energy as well as your love life. It can also promote a more positive outlook and make you more wise. Peridot is one of the more ancient stones on this list and has been the subject of gemstone folklore for thousands of years. They have been known as protective stones that can dispel even the worst bad dreams and fearful thoughts. Peridot also promotes friendship and can guard against jealous thoughts. Sapphire comes in a rainbow of colors, and in a similar fashion, is able to assist with many ailments. Though most commonly associated with the brow chakra, it can be used in coordination with many other chakras depending on the color. Sapphire can enhance overall mental clarity and help minimize negative thoughts. There is no doubt by looking at the stone above that opal is a creativity stone. It can enhance your imagination and overall youthfulness. It is known as a water stone due to the sheer amount of water the stone holds, and therefore, its energy is closely aligned with moving water. Like water is always changing, so too can opal help ease transitions associated with change. Topaz is known as a sacred stone that has the ability to cleanse thoughts and increase vitality. It can enhance awareness to your own thoughts, making it easier for the wearer to place energy where healing is needed the most. Turquoise is the only gemstone on this list that comes in a vibrant, opaque hue. Rather than expel unique healing energy onto its owner, turquoise does the opposite by taking on specific traits of the wearer. This trait enhances the wearers' ability to analyze their own thoughts. It is also associated with the throat chakra, making this stone an aid to communication. Not only will turquoise help you better understand yourself, it will also allow you to communicate your ideas to others.